WASHINGTON — James Back, a native of Hot Springs, Ark., and a federal employee here since 1961, could hardly believe his eyes this past Wednesday. About 300 yards from Mr. Back’s standing-room spot stood President Bill Clinton, who was basking in the glow of a spring-like sun that reflected off the U.S. Capitol. A man who had been two years behind Back during their Hot Springs school days, Mr. Clinton looked out over the sea of people gathered for his inauguration and called for a season of American renewal. “I still can’t believe it,” said Mr. Back, who is a personnel officer for the Department of Commerce. “Back then he was sort of a strange guy. He wore the pocket protector and he was in the band. That was the stranger side of the school. We were too cool to be in the band. President Clinton’s inaugural address served as the climatic rallying moment for the “American Reunion” celebration he and his family had hosted since their arrival in Washington the previous Sunday. Put simply, this reunion brought together “regular people” like Mr. Back and his wife, June, with stars of both entertainment and politics. For four days Americans of all age groups and ethnic origins came to the nation’s capital in record numbers for a presidential inauguration. Mr. Back wasn’t alone in his assessment. In conversations with many people on the National Mall, two themes came shining through. Along with the largest fireworks display in Washington’s history (last Sunday) and the chance to see some of the country’s top-name entertainers for free, people from across the U.S. were drawn into the capital city by their renewed hope for the country and a desire to witness history. Like the president’s and Mr. Back’s native Arkansas, each state had a story and Tennessee was among them. Chattanooga was among them, also, with a myriad of American cities represented. During a week filled with symbols, such as President Clinton’s ringing in “the arrival of change” with the Liberty Bell replica at Arlington National Cemetery before Sunday’s fireworks display, a group from Avondale Seventh-day Adventist School in Chattanooga helped represent the country’s future. Robert Williams, social studies teacher for the sixth-, seventh- and eighth-graders at the Avondale School, had been planning this inaugural trip since last May. “It began last year in May and I got together with Educational Field Studies,” said Mr. Williams. “We started in August selling the parents on the idea and I immediately sold the students on it. Then we started having fund-raisers and donations and we were able to make the trip. Last Tuesday, Mr. Williams stood on the steps of the U.S. Capitol. The next day, President Clinton would take his oath of office at the same building with the Avondale students as witnesses. For 3rd District Congresswoman Marilyn Lloyd, who greeted the Avondale group, the chance to see some of the youth whose national interests have been entrusted to her underlined the importance of the tasks she and the administration face. “Look at all the young people we have here, observed Rep. Lloyd. “I was telling them that it is always exciting to me to bring young people over to the Capitol. It gives me the opportunity to explain to them what that dome means to me, and what it means to all of us. In her 10th term, Rep. Lloyd has been in Washington for the four previous inaugurations, but she said none compared with the fifth one she witnessed Wednesday. 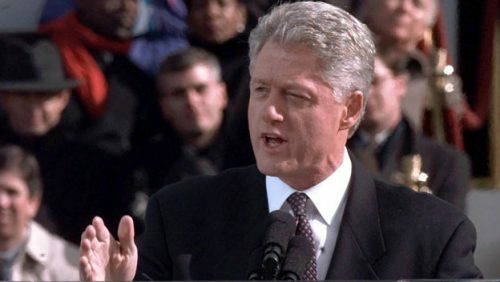 As the rest of the president’s address rang out like the Liberty Bell that sounded at the beginning of this celebration, the reality of a Clinton presidency and the American reunion he had hosted began to take hold for the Backs. “We still can’t believe he’s the president,” said June Back.